Posted on 26/04/2012 by Trần Phước Hùng	| Bạn nghĩ gì về bài viết này? For some reason i found Apache POI difficult to use for reading excel sheet, in terms of naming conventions and the code so i was searching for another Library for reading Excel Sheet in Java and i stopped at JXL. Java Excel API namely JXL is an Java based API that allows us to read/write/edit the Excel Sheet. The main think i liked about it was its simplicity over Apache POI Package. This article will show you how we can read Excel Sheet using JXL. Posted on 20/04/2012 by Trần Phước Hùng	| Bạn nghĩ gì về bài viết này? Long long time ago(2010-05-19), I have a post "Android FaceDetector" about how to use android.media.FaceDetector to identify faces in a Bitmap. 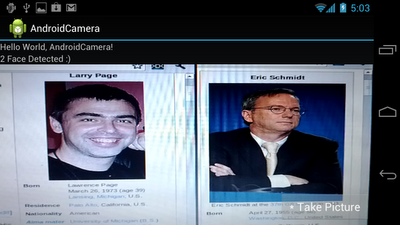 Start from Android 4, API Level 14, the android.hardware.Camera class provide the feature of Face Detection. You can build apps to detect face on camera at live. The method startFaceDetection() starts the face detection. This should be called after preview is started. The camera will notify Camera.FaceDetectionListener of the detected faces in the preview frame. The detected faces may be the same as the previous ones. Applications should call stopFaceDetection() to stop the face detection. This method is supported if getMaxNumDetectedFaces() returns a number larger than 0. If the face detection has started, apps should not call this again. When the face detection is running, setWhiteBalance(String), setFocusAreas(List), and setMeteringAreas(List) have no effect. The camera uses the detected faces to do auto-white balance, auto exposure, and autofocus. If the apps call autoFocus(AutoFocusCallback), the camera will stop sending face callbacks. The last face callback indicates the areas used to do autofocus. After focus completes, face detection will resume sending face callbacks. If the apps call cancelAutoFocus(), the face callbacks will also resume. After calling takePicture(Camera.ShutterCallback, Camera.PictureCallback, Camera.PictureCallback) or stopPreview(), and then resuming preview with startPreview(), the apps should call this method again to resume face detection. It’s modify from the exercise "Start Camera auto-focusing, autoFocus()" to add function of face detection. Modify main.xml to add a SurfaceView for camera preview, and a TextView to display the number of face detected. Create /res/layout/control.xml, it’s a view overlap with the preview SurfaceView, to provide a button to take picture. android:text=" * Take Picture "
Main code, call camera.startFaceDetection() after camera.startPreview(), and call camera.stopFaceDetection() before camera.stopPreview(), also define our FaceDetectionListener to display the result of number of face detected. Modify AndroidManifest.xml, to add permission of "android.permission.CAMERA", and set android:minSdkVersion="14". Declare your native methods in an otherwise normal Java class. Generates .h files. Here is the code. Write your native code, using the .h file generated above Copy the function prototype from the .h file and paste it in. The above uses Microsoft Visual C++ command-line tools. Modify your Java class to load the library. Posted on 03/03/2012 by Trần Phước Hùng	| Bạn nghĩ gì về bài viết này? Posted on 28/12/2011 by Trần Phước Hùng	| Bạn nghĩ gì về bài viết này? To create a application to run in the background of other current activities, one needs to create a Service. The Service can run indefinitely (unbounded) or can run at the lifespan of the calling activity(bounded). Please note that a Service has a different lifecycle than activities therefore have different methods. But to begin a service in the application a call to startService() which envokes the service onCreate() method and onStart() beginning running the service. Calling the applications stopService() method to stop the service. Something that we didn’t use in this example is bindService() which just calls the services onCreate() method but does not call the onStartCommand(). onBindService() is used to create persistance connection to the service. 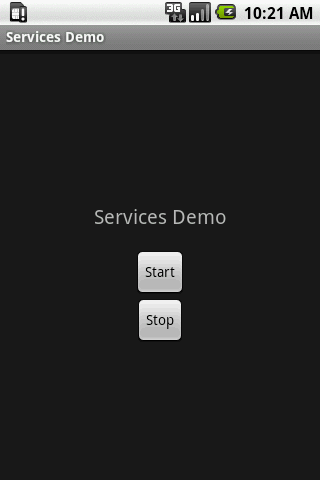 This Services Demo is simple as it plays a audio file and by listening to click events of the buttons invokes the MyService service. Posted on 16/12/2011 by Trần Phước Hùng	| Bạn nghĩ gì về bài viết này? This will create a file alright, but that file will not be a true UTF-8 file. Infact, this is a known and documented bug in the JDK that SUN will never fix! There are other problems with the java.io package when it comes to unicode, for example, the OutputStreamWriter will not write an ASCII stream correctly leaving a ‘?’ at the beginning of the output stream if input stream was Unicode. // will not process it correctly. br.close(); // Close the input. w.close(); // Flush and close output. * back to the stream, only BOM bytes are skipped.